Welcome to the 2016-2017 season of the T. Gilbert Pearson Audubon Society. I think we have put together an exciting year of programs, Second Sunday Nature walks, and other events. Our year kicks off with Curtis Smalling's presentation on Chimney Swifts, Audubon's Bird of the Year. We'll also do a Swifts Night Out in downtown Greensboro, hoping to catch a Swift flock descend into its nighttime roost. As the year goes on Dennis Burnette will again present his well-received Beginning Birder Workshops, and Ann Walter-Fromson will repeat her “wildly” popular Wildflower Walks. November's program will be given by Tom Earnhardt, host of the WUNC/PBS show "Exploring North Carolina." There is much more, but I mention these only to whet your appetite for TGPAS events coming this year. I also want to alert you to the new administrative structure for our chapter, and those who will fill the new roles this year. Yours truly will serve as Chair; Lynn Moseley will be co-chair; Sarah Gilley is vice-chair; and Marie Poteat is waiting in the wings to enter the rotation. All these positions are for one year, which will hopefully encourage more members to feel comfortable taking on a chapter administrative role. Next year I will transition to immediate past chair, the board slot Dennis Burnette fills this year---thank you, Dennis, for your years of service to the chapter, which we trust will continue. Again, welcome to the new TGPAS season. Read on in Nature Notes for details about events coming up in the next few weeks We hope to see you at many of our programs, walks and work/fun projects. If you'd like to help make Pearson Audubon even better please let us know, as there are many small tasks that go undone for lack of someone to do them. 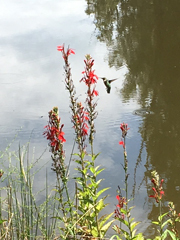 Learn about gardening for hummingbirds at noon, Thursday, Sept. 8, at the Lunch and Learn Session at Paul J. Ceiner Botanical Garden in Kernersville. The speaker is Audubon North Carolina's own Kim Brand. Here in the Triad, we not only have Ruby-throated Hummingbirds raising babies in the summer, we also live right along one of their major migratory pathways -- the Atlantic Flyway. Your yard -- and the kinds of plants in it -- matters more than you may know, to our tiniest birds and many others too. Find out how you can help hummingbirds in every season of the year (yes, even winter! ), as well as helping other birds in your yard, by planting native plants, putting up birdhouses, and providing shelter and water. Your yard can make a real difference for birds year-round. Learn how you can start helping birds in your yard and in your community. Kim Brand is the Bird-Friendly Communities Coordinator for Audubon North Carolina, a state program of the National Audubon Society. 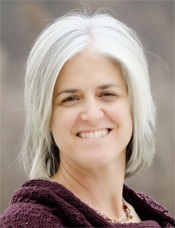 Kim has a master's degree in ornithology and was an Audubon Toyota TogetherGreen Fellow in 2013 for her work with Habitat for Humanity and Audubon in Forsyth County. Kim lives with her two daughters in Winston- Salem. Lunch and learn is FREE to Members of the Ceiner Botanical Garden or a $2 donation for non-members. Registration is required. Please call (336) 996-7888. You are invited to the Audubon Natural Area to join some energetic volunteers participating in this year's Big Sweep event beginning at 9:30 a.m. Saturday, Sept. 10. We will "sweep" the Audubon Natural Area from Elm to Church for trash and debris, which will then be hauled away. In conjunction with the Great American Cleanup in the spring, these events are critical for keeping our natural area "natural." Gather at the Natural Area to spend an hour or two policing the trails and property. Sturdy gloves, tick repellent, and tools for spearing or grabbing trash are recommended. Trash bags and plastic gloves are provided. Parking is available at the Audubon Natural Area by driving over the curb onto the grass at the entrance sign on Tankersley Drive, or by parking at the bank at the intersection of Tankersley and Church. The event is part of a larger event held in late summer/early fall by Greensboro Beautiful volunteers, who get litter out of our waterways, off our streets, and out of our neighborhoods. Scout troops, community organizations, faith communities, schools, businesses, and families take part in the cleanup, showing our community's concern for cleaner waterways and public areas. Pizza and water will be available for free from Greensboro Beautiful at the trash collection point after the event. Join us! On August 4, Linda Hayes and Jim Eldrett reported to the Natural Area for some trail work. The Hillmer Trail was put back in order; sticks removed, bordering logs realigned, and overhanging trees and shrubs pruned. The back third of the trail required most of their attention, as the sunshine and rain resulted in vigorous growth of plants bordering the trail and impeding progress. The second shift arrived later in the day, with the mowing team of Jack Jezorek and Terry Woodrow taking care of portions of the meadow trail and the Hillmer trail. TG Pearson Audubon Society will kick off the new program year with a great program by a wonderful speaker we have been fortunate to hear before. Audubon’s Curtis Smalling will talk about the Audubon NC Bird of the Year, Chimney Swift. Curtis Smalling is the Director of Conservation for Audubon North Carolina. He’s based in Boone, and so we are fortunate that he will be able to take time from his busy schedule to come down from the mountains to join us. Our kick off program for the 2016-2017 program season will be on Thursday, Sept. 8, beginning at 7:00 pm at the Kathleen Clay Edwards Family (KCEF) Branch Library, in Price Park, 1420 Price Park Dr., Greensboro, NC 27410. We invite you to get there a bit early for some social time before the program starts. 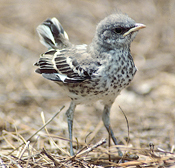 to Eastern Birds, Wikimedia Commons. Join us for a natural spectacle in downtown Greensboro! Of course, this spectacle occurs at many places every night, but we have selected this site for its familiar and convenient urban setting. 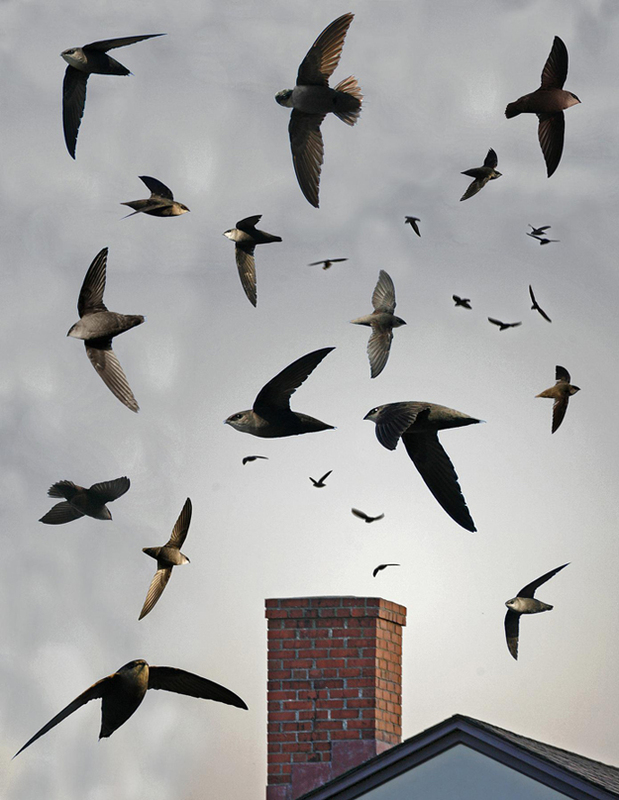 This is the time of year when Chimney Swifts join together at the end of the day to roost. After all, they’ve been flying all day without a rest, and they are tired. They will need rest before migration begins soon. Roosting and nesting sites for Chimney Swifts are disappearing, which causes concerns about the survival of the swifts. Audubon NC is acting to help them and will soon be providing us with information on how we can help. We will meet downtown at the new Joy Monger Brewery at the intersection of Smith and Battleground at 6:30 p.m. Thursday, Sept. 15. This will give us enough time for a brew (if you wish) before we drive or walk to our destination nearby. We will depart from the brewery by 7 p.m. You will know us – we will have on binoculars! Wear yours, too. The swifts will begin to gather gradually as sunset approaches. Their roosting ceremony will continue for about 30 minutes after sundown (7:27 p.m.). Please join us for our first Second Sunday Nature Walk for the new program year in Jamestown to explore a variety of habitats from hilltops to river bottom forests along the Deep River. In addition to the many acres of native tall grass prairies planted by the owner over the past several years, eight newly planted acres of native short grass prairie with native pollinator plants now fill a right of way following the river corridor. With good weather, there will be good birding and lots of butterflies. The property has been registered as a Monarch Waystation this year, which provides a diversity of native nectar plants for the adult Monarchs and many varieties of milkweed species that are the only food for the caterpillars of this species. Each year the owner is continuing the management of invasive non-native plants and additions of many new native plants in support of the Audubon North Carolina Bird-Friendly Communities program. You may join the guided tour or with a map take a self-guided tour. The walking tour is a moderate walk, but be sure to bring water, bug spray, and good walking shoes. For those carpooling, meet at Friendly Shopping Center in front of Whole Foods at Friendly Center at 1:30. For those driving directly to the property, please arrive at 2 p.m. The address is 1111 Bales Chapel Road in Jamestown. There is plenty of parking, which will be marked. You may contact Marie Poteat at 336-491-8454 or send her an email by clicking here. 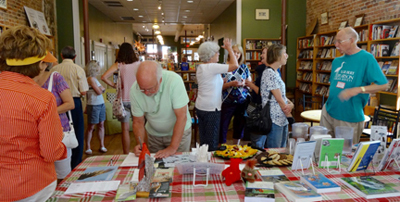 TGPAS held it first major social on Sunday afternoon, Aug.14, a Meet and Greet at Scuppernong Books in downtown Greensboro. More than 30 folks stopped in for some fruit, cookies, and iced tea and to chat with fellow Auduboners. Some who dropped by had just recently joined and wanted to get to know those of us who are long-time members and to find out what the chapter has going on. This was exactly what we intended for the Meet and Greet event. In addition to Audubon members, several people came to the back of the bookstore just to see what Audubon was all about, having seen Scuppernong's chalkboard sign about the event out front. This was an unexpected bonus of holding the event at Scuppernong. All who attended agreed that social events should be a regular part of our programming, maybe three or four times each year. Forsyth Audubon holds regular "Birds and Beer" socials. What should we call ours? Chickadees and Chat? Feathers and Food? Chirp in--er, chime in with your suggestions, not only for a name but for the types of social gathering you'd like to see. Let us hear from you by clicking here. Fledgling birders will have an opportunity to brush up on their skills again this season. Our series of three Beginning Birder Workshops will be offered at the KCEF Branch Library on Sunday afternoons from 2:30 to 4:30. Oct. 30 – "Introduction to Birds and Birding"
Mar. 26 – "How to Identify Birds"
Apr. 23 – “How to attract Birds to Gardens and Feeders"
Ten TGPAS folks joined about 40 other chapter members from across the state and Audubon North Carolina staff at Haw River State Park on Sunday, Aug. 21, for the state's Chapter Day. We heard presentations on what the state office staff are doing within the climate change initiative; heard from several Climate Ambassadors, including our own Sarah Gilley; and discussed how we can move forward on this problem that affects our birds. A member from each chapter took a few minutes to share some of the successes of their group. This is a valuable way to learn from other Audubon groups about how to make chapters more effective and appealing to new members. TGPAS Chair Jack Jezorek described the on-going work that we are doing at the Audubon Natural Area in Greensboro, such as our trail building, installation of benches as part of an Eagle Scout project, and our fall work to begin to remove some of the invasive species found there. One of the sessions had attendees break into groups to discuss chapter issues such as fund raising, membership recruiting, diversity, and project implementation. Each of these is an issue confronting the Pearson chapter and will receive attention from our board in the coming months. Our dessert for the day was a presentation by ANC Director of Conservation Curtis Smalling on Chimney Swifts, the 2017 Bird of the Year. Note that Curtis will be presenting a broader picture of this bird and what we can do to ensure its future in our state at the TGPAS September program meeting. Chapter Day is always a highlight of the summer where folks from across the state and the state office can share ideas about how our work can be more effective and efficient. If you have never attended one, make a mental note to do so next year. If you were there last month, plan to join us again next year.